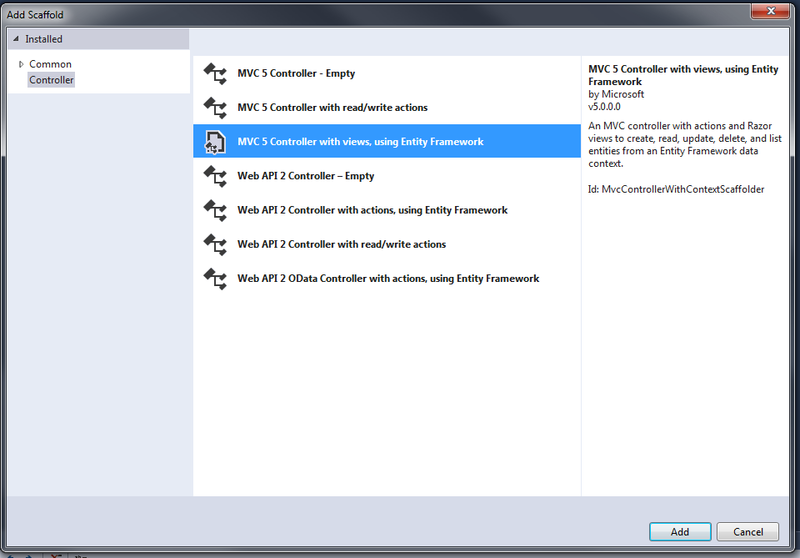 This documentation is focused on ASP.NET MVC5 version. It assumes a minimum knowledge of asp.net technology. 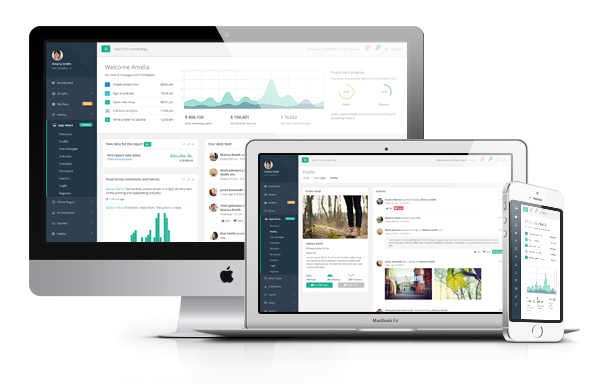 It describe mainly files and structure in project. Please note that this documentation is dedicated to the main element of the template. With each version, we will try to develop it. But if you have any questions going beyond what is described here don't hesitate to write to us. @RenderBody main container for page elements. 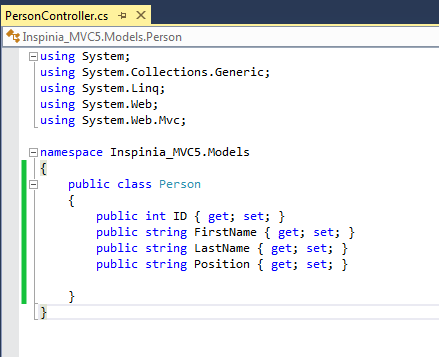 Please note that Inspinia ASP.NET MVC6 is beta version. Once ASP.NET 5 will be released official then we will provide required changes and publish final version. 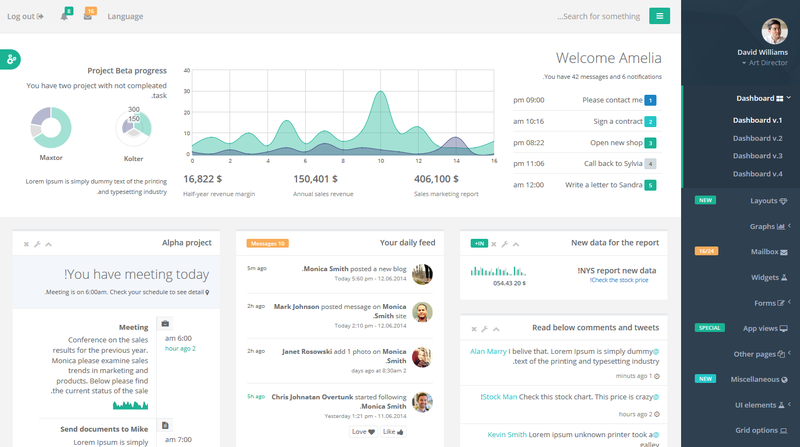 Full documentation for new project will be released once final version will be finished. 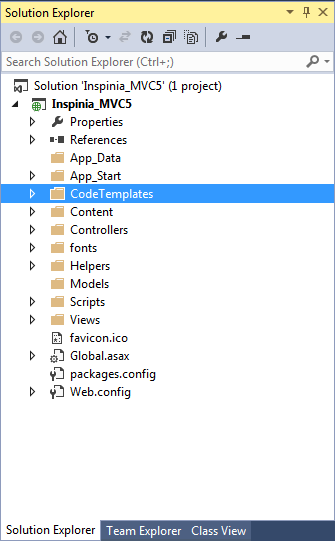 File structure are the same as the MVC5. Please note that new MVC6 not use bundle system. In This project we use Gulp for compile SCSS style files and minify js files. Additional new project use bower to download most of the plugins. Those plugins are stored in wwwrooot/lib_bower. If some of the plugins don't have bower package or we use changed version then this plugins are stored in wwwroot/lib folder. 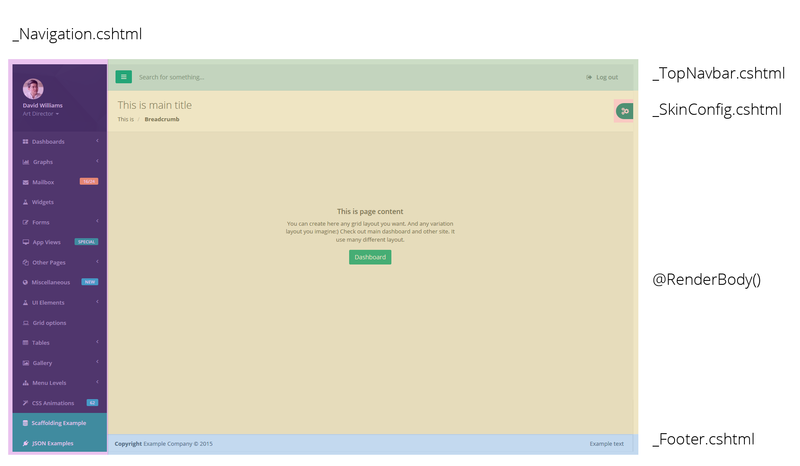 Page <head /> contains Metadata and CSS bundle files for theme. We use special section AddLocalStyles, to import styles for specific plugins on pages that need it. IMPORTANT - Main stucture of _Layout.cshtml file. On bottom of file are bundle script located. 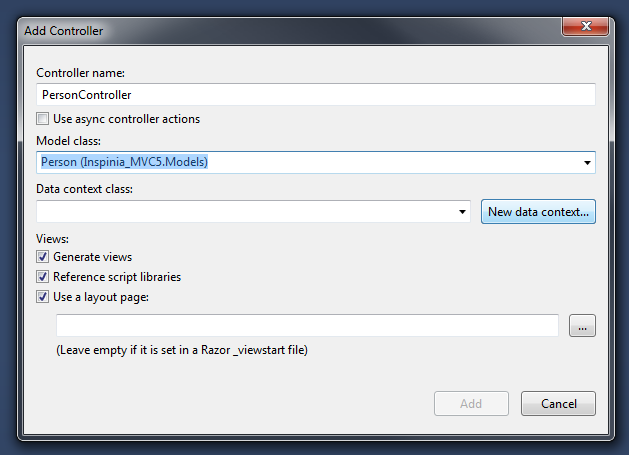 _Layout.cshtml contains all major plugin scripts and Inspinia scripts. 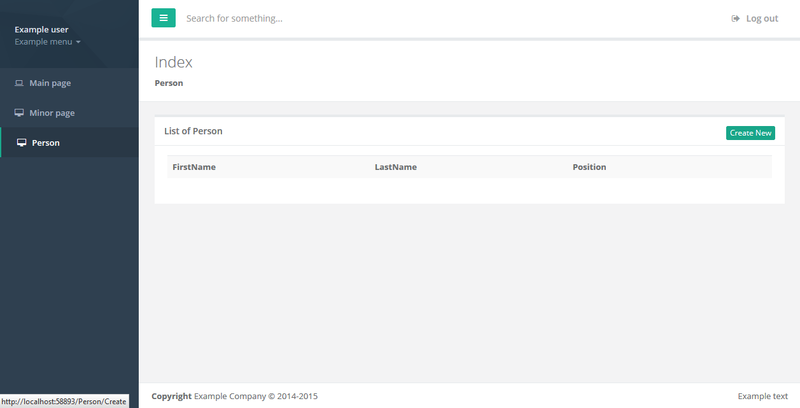 In section Scripts, will be import scripts for specific plugins on pages that need it. To add for example iCheck plugin (plugin for custom checkbox input) at the bottom of page (view) you have to specifie Styles and Scripts with name plugin as example below. 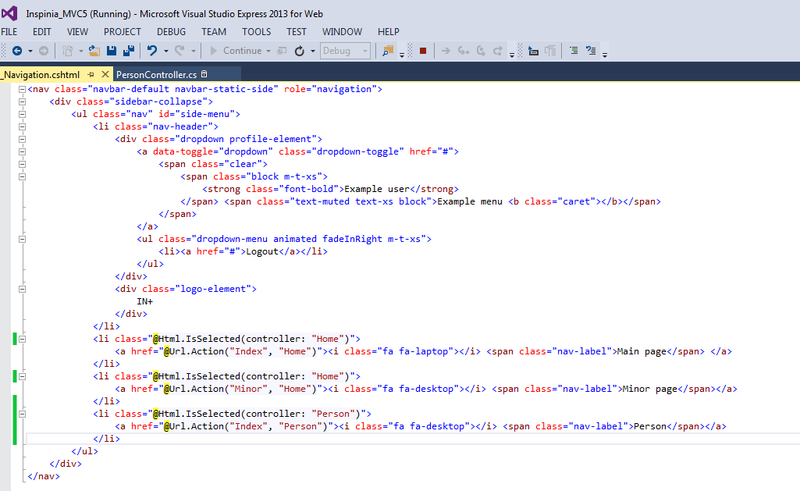 Or if you want to add it to entire app you can add it to _Layout file. If you need any help with render section feel free to write me at support@webapplayers.com. Please note that some plugin have own images so path to the bundle has to be relative for example ionRangeSlider plugins. To use off canvas menu you just need to use _Layout4.cshtml. The body has special .canvas-manu class and it include special _NavigationOffCanvas. 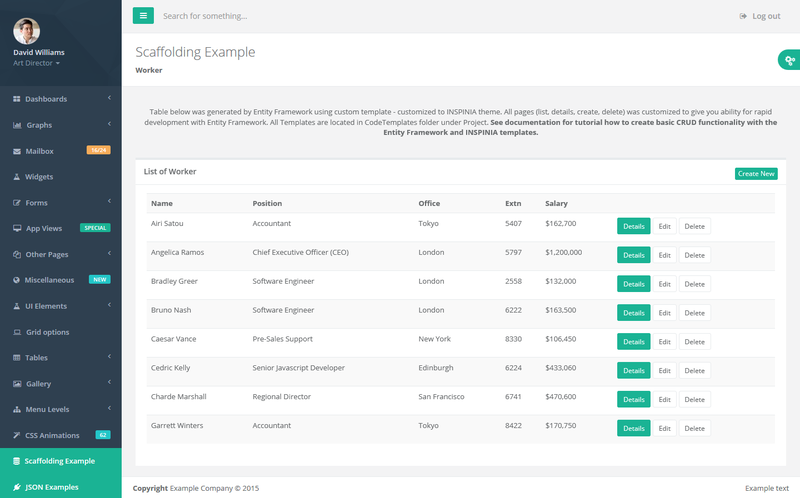 In CodeTemplates we add special customized template for Scaffolding. 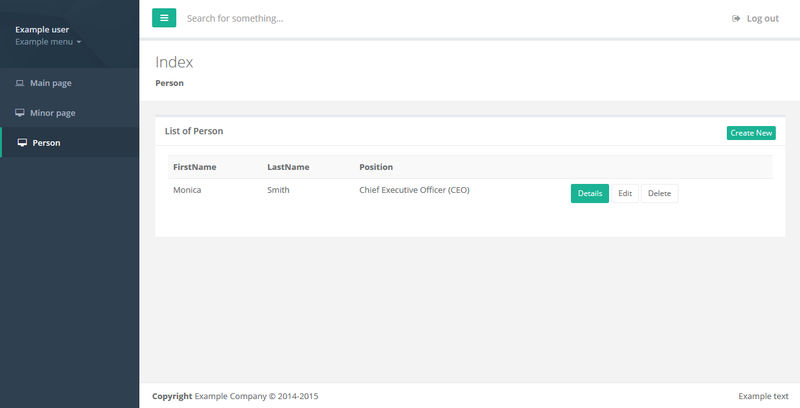 If you run app and go to Scaffolding page then you will see a full generated code and views with customized look and feel for Inspinia theme. 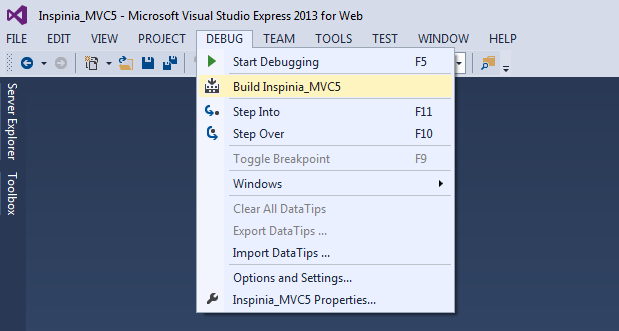 In this section we will show you have to go throw scaffolding with customized template on Inspinia MVC5 SeedProject. 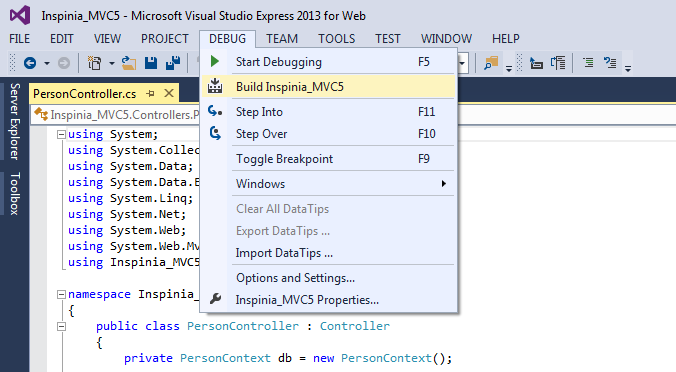 When you open Inspinia Seed Project you will see in Solution Explorer folder CodeTemplates. This folder contains scaffolding templates. This folder must have the CodeTemplates name. 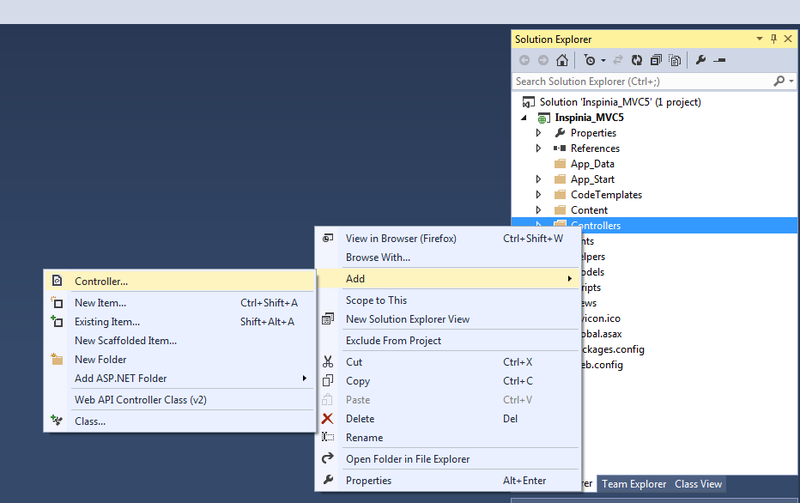 Entity framework first check for this folder in solution and if he find it he will use templates from there. Lets add simple model for our demo purpose. 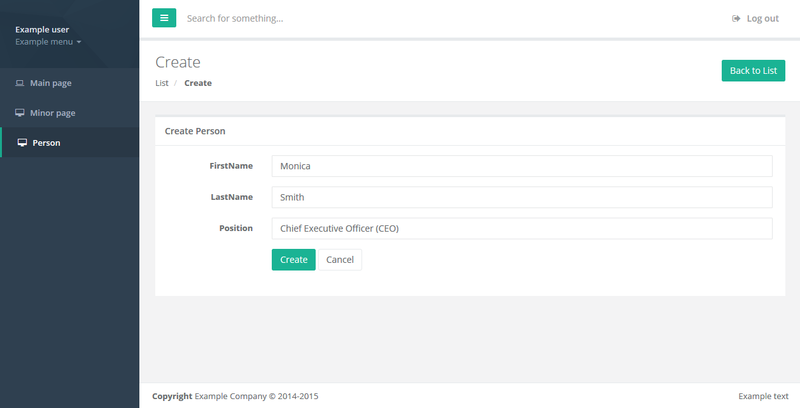 Using Scaffolding and Inspinia templates you can creat simple and fast basic app wtih nice look and feal writing only a model!! 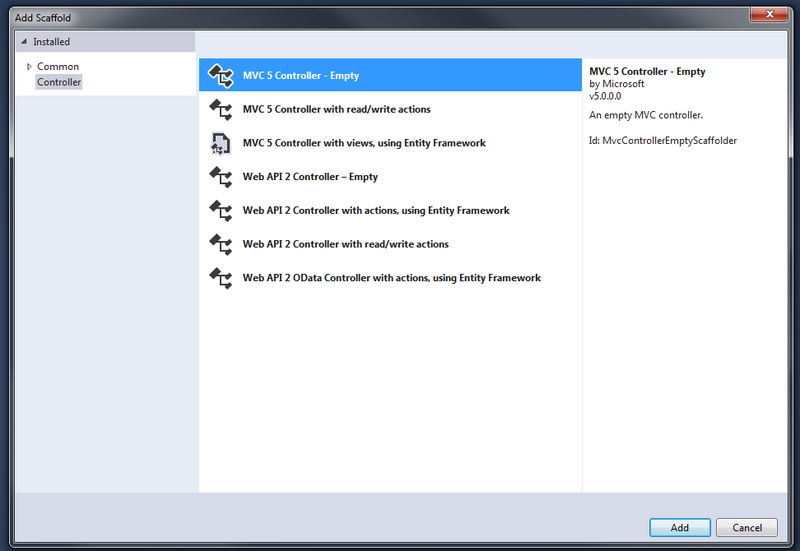 It is an application skeleton for a typical ASP.NET MVC5 web app. 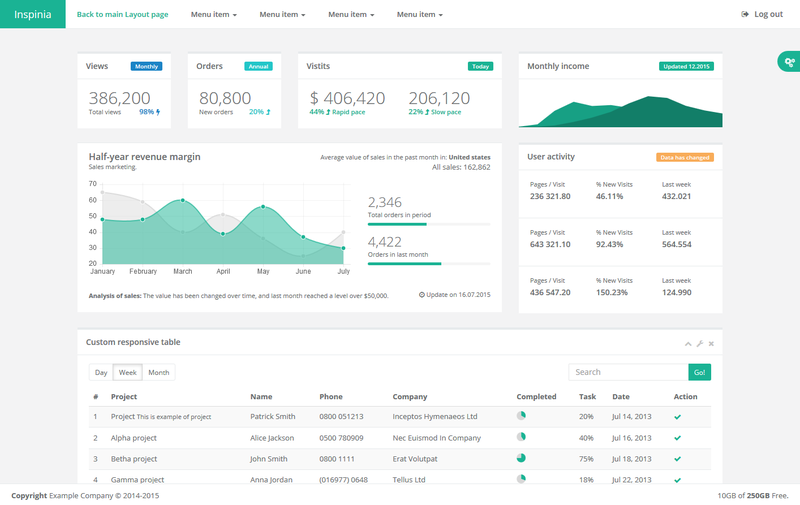 You can use it to quickly bootstrap your mvc webapp projects and dev environment for these projects. 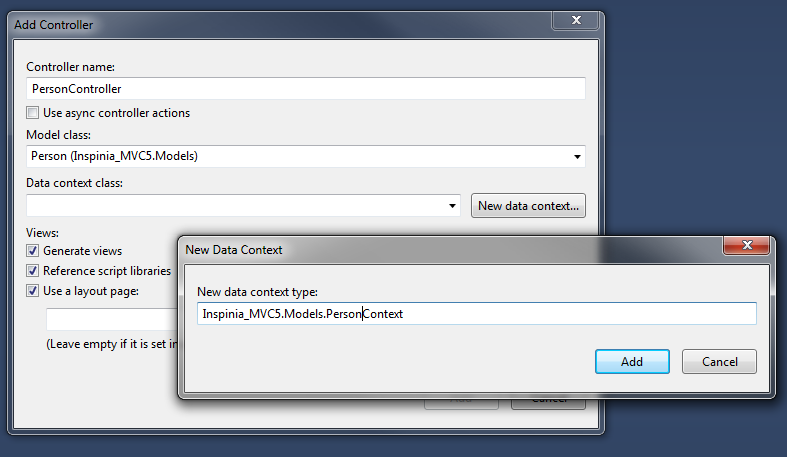 Please stay tuned for 2.2 version to get new features for ASP.NET MVC5 version. Views/AppViews/Faq.cshtml - Fix the collapse effect - Create new div element .faq-answer before p answer.